Welcome to The Porsche Exchange, where you can always "Expect The Exceptional!" We are the largest-volume Porsche dealer in the Midwest. Meaning you'll find the largest selection of inventory here, so that you never have to settle. We are Chicagolands only Porsche Premier dealer again this year. Meaning you'll receive a level of service here that is above and beyond what other Porsche dealerships offer. We are the Midwests only Porsche Exclusive Manufaktur Partner Meaning our highly trained staff is uniquely prepared to help you navigate the virtually endless customization possibilities to create your dream Porsche. If you have any further questions whatsoever about this listing, please don't hesitate to call us at 847-266-7000 or email tim.j.fehr@4porsche.com We truly appreciate your interest in this vehicle and we look forward to earning your business! This Porsche includes: LED-MATRIX HEADLIGHTS IN BLACK W/PDLS+ WHEELS: 21" EXCLUSIVE DESIGN IN HIGH-GLOSS BLACK Aluminum Wheels 18-WAY ADAPTIVE SPORT SEATS Power Passenger Seat Adjustable Steering Wheel Power Driver Seat Passenger Adjustable Lumbar Driver Adjustable Lumbar Bucket Seats AIR OUTLET GRILLES PAINTED IN HIGH-GLOSS BLACK TINTED LED TAILLIGHTS W/ADAPTIVE BRAKE LIGHTS FRONT SEAT VENTILATION Cooled Front Seat(s) Heated Front Seat(s) 4-ZONE CLIMATE CONTROL Multi-Zone A/C A/C Climate Control Rear A/C SPORTDESIGN PACKAGE PAINTED IN HIGH-GLOSS BLACK MODEL DESIGNATION PAINTED 7.2 KW ON-BOARD CHARGER WINDOW TRIM IN HIGH-GLOSS BLACK REAR AXLE STEERING W/POWER STEERING PLUS All Wheel Steering PORSCHE LOGO IN BLACK BRUSHED ALUMINUM INTERIOR PACKAGE TRUFFLE BROWN, CLUB LEATHER SEAT TRIM BURGUNDY RED METALLIC SPORTS EXHAUST SYSTEM W/TAILPIPES IN BLACK DOOR HANDLES PAINTED IN HIGH-GLOSS BLACK PREMIUM PACKAGE PLUS Cooled Front Seat(s) Heated Front Seat(s) Blind Spot Monitor *Note - For third party subscriptions or services, please contact the dealer for more information. * You deserve a vehicle designed for higher expectations. This Porsche Panamera delivers with a luxurious, well-appointed interior and world-class engineering. All-wheel drive means peace of mind all the time. 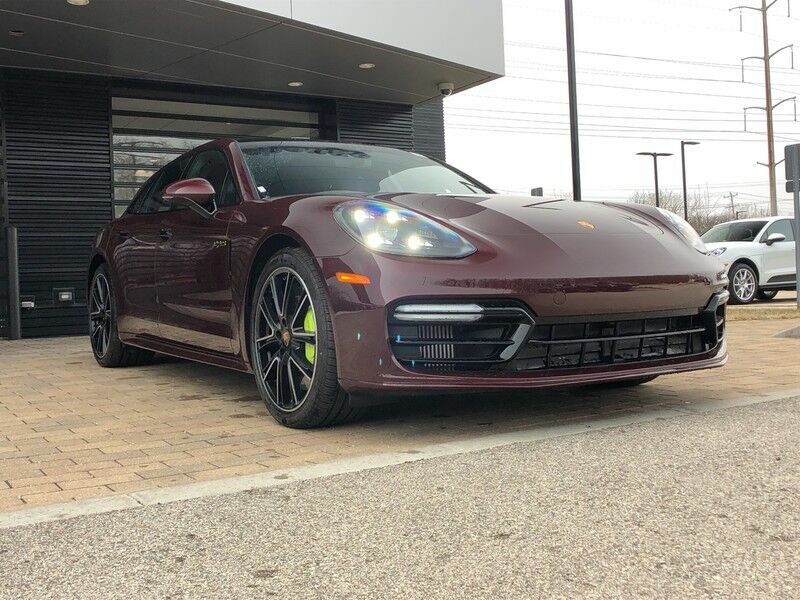 This Burgundy Red Metallic AWD Porsche enjoys a host offeatures, including exceptional acceleration and superior stability so you can drive with confidence.